This week at Inspire 2018, Microsoft announced Colligo as one of the charter members of the Microsoft Content Services partner network. This end-to-end stack of software and services, powered by Office 365 apps and SharePoint, enables intelligent content management in today’s digital workplaces. Whichever terminology you prefer, the point Microsoft makes is that content today is “evergreen”—shared and dynamic. Creating a static document and publishing it to a silo has limited usefulness; value is added when workers collaborate on and iterate documents. At the same time, this dynamism needs to be balanced with appropriate control and management of the content, particularly in highly-regulated industries. 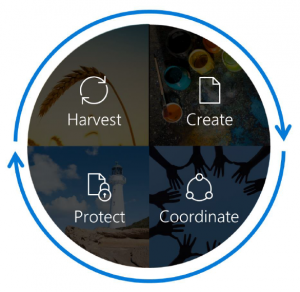 Let’s look at the four pillars of the Microsoft content services framework and what they mean for knowledge and records management. The content services platform enables content to be managed as soon as it’s created, using content types driven by templates and metadata. Publishing content is also simplified and integrated, using familiar tools like the Office applications we use every day. Colligo Email Manager for Office 365 is foundational to this pillar, enabling email content to be seamlessly captured to SharePoint and tagged with metadata in real time. Living content needs an active group of people collaborating on it or it will harden and quickly become irrelevant or lost. A study cited by Microsoft suggests that a whopping 3.6% of US GDP is spent re-creating content users can’t find (Nucleus Research. “Content Bloat Drains Productivity by 8 percent.” June 2016). Concerns about user adoption are mitigated with Microsoft Content Services because workers can easily edit and collaborate using Office 365 apps, or other familiar third-party tools like the Adobe suite. Content is easily tagged with metadata and structured within SharePoint libraries. This is an area Microsoft is investing in heavily. Records retention, disposition and overall lifecycle governance are becoming more sophisticated using the Advanced Data Governance features in Office 365. Colligo again plays a significant role in the stack here, uniquely capturing both metadata (SharePoint properties) and retention labels for content lifecycle and records management. (You can learn more about labels in our recent webinar here). This last pillar refers to making content easy to find, both to keep it alive, active and relevant, and also to facilitate processes like eDiscovery or responding to FOIA requests. Microsoft’s robust Office 365 search looks across Exchange, SharePoint, OneDrive, and even Skype for Business to ensure that content is surfaced. The cloud hybrid search even compiles results for both on-premise and cloud content. Finally, social-themed tools like Microsoft Graph and Delve mean relevant content is surfaced more rapidly and not left hidden.